Frequently Asked Questions Certain questions come up again and again. Here you can find answers to the most common questions. If you can´t find the answer you´re looking for, please don´t hesitate to contact us. USPA United States Press Agency (Registered Trademark), or USPA for short, is one of the leading professional industry organizations and agencies for journalists, reporters and press photographers in the United States. The agency sees itself as an international, non-partisan and non-tariff representative of interests, is politically and financially independent and not associated with any unions or publishers. We represent the career, legal and social interests of authors, PR officers, press photographers, videographers, bloggers, press representatives and journalists, among others. 2. Who can join USPA? Anyone who is employed or works as a freelance journalist can apply for membership. Unlike many other journalist organizations and agencies, the USPA doesn´t differentiate between part- or full-time workers. Since professional journalistic work cannot be measured by income or whether it was done by a full-time journalist, USPA ensures that freelancers also have the chance to become a member of an organization and reap all the benefits it offers. 4. Is USPA press pass internationally accepted? USPA is an officially registered international press and journalist press agency with a registered office in the USA. United States Press Agency is authorized to issue the USPA press pass, which is officially recognized. USPA press credentials are officially registered (International Association of Press Photographers Registration Services). Thanks to the agency´s hard work, the press pass enjoys a high level of acceptance at agencies, businesses and with organizers and is on par with the national identification cards of countries such as Germany, Austria, Switzerland, England, France, the Netherlands and Belgium. 5. Is there such thing as an official press card? Press cards are issued by journalist agencys, not by government. There is no such thing as an official press card. Journalist associations are not authorized to give press cards to exclusive groups of journalists. Anyone who represents the press (whether full- or part time) has the right to a press card. USPA stays true to this principle. 6. What are the benefits of USPA membership? The right to bear the title "Member of the United States Press Agency" or "Member of the USPA"
7. What are the benefits of having a press pass? Although holding a press pass does not give you, a representative of the press, the right to be admitted to events for free, most organizations assume that this card means that you have a journalistic background without asking any questions. In isolated cases, documents proving you are covering the news are asked for. With a press pass, you also get admission to inaccessible areas which are off-limits for non-journalists. However, don´t forget that every organizer can make use of the house rules and decide for themselves which media representatives to let in. Tips on how to get into sought-after tradeshows and events despite being rejected can be found in the protected member area. 8. 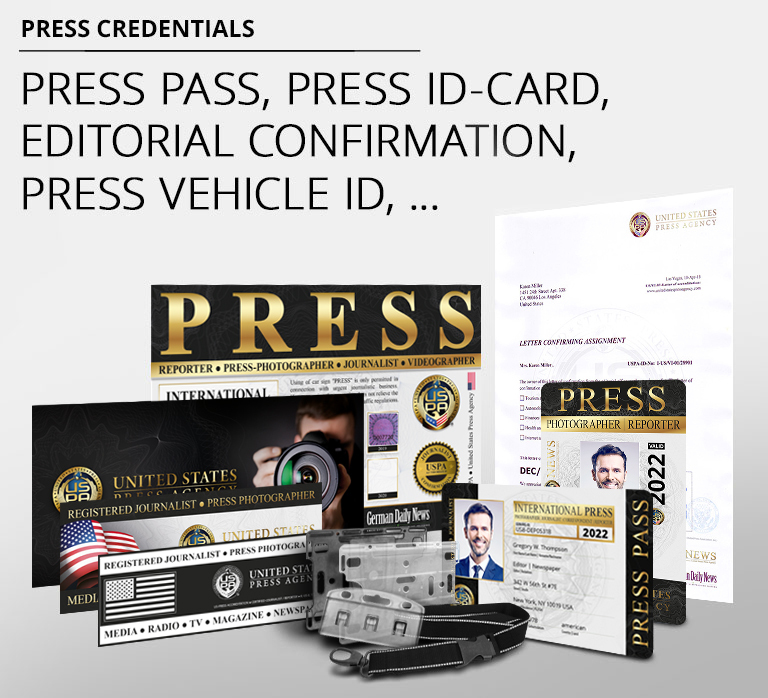 What are the benefits of having a press vehicle ID for your car? When using a press vehicle ID for journalistic work, you´ll get access to blocked-off areas and use of special parking spots (for example at tradeshows, concerts, sports events and other functions). The press vehicle ID, however, does not protect you from getting parking tickets when you have parked illegally. But, in media-friendly cities, many have observed that the police often look the other way when a press vehicle ID is displayed in a car. The press vehicle ID may only be displayed when the car is being used for journalistic purposes. It is only valid along with a press pass. It can be extended yearly with an annual stamp. 9. Why is the press pass issued new every year? This serves to protect the identity documents from being copied or counterfeited. The card´s visual design is changed yearly, and the security marks are constantly re-implemented. USPA press passes are registered and provided with the current year which proves its validity.